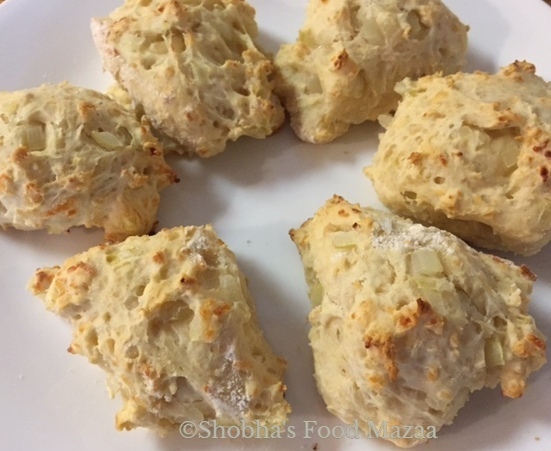 These savoury biscuits with cheese and onion flavour are perfect with a bowl of hot soup. They taste better when they are freshly baked. I prefer making a small quantity to finish on the same day. Place the diced onions in a bowl and microwave on high for 1-2 minutes until translucent. Alternately you may also saute in a pan with little butter. In a large bowl combine the flour, baking powder, baking soda and salt. Cut in the butter until the mixture resembles coarse crumbs. Tip in the grated cheese and onions. Stir in the milk until moistened. You may also use buttermilk instead. Turn onto a lightly floured surface and knead to mix everything. Place them 2 inches apart on a greased baking sheet. Bake at 450 F (230 C) for 8-10 minutes or until golden brown. They are a perfect accompaniment for soups in winter. Note: These biscuits have a slightly softer texture. If you want them slightly crunchier then flatten them a bit before baking and bake for a couple of minutes more. You can double the quantity to make more biscuits. These sound like a perfect way to enjoy soups. Much healthier than croutons. Yes, I love them with soup and they make a light meal. 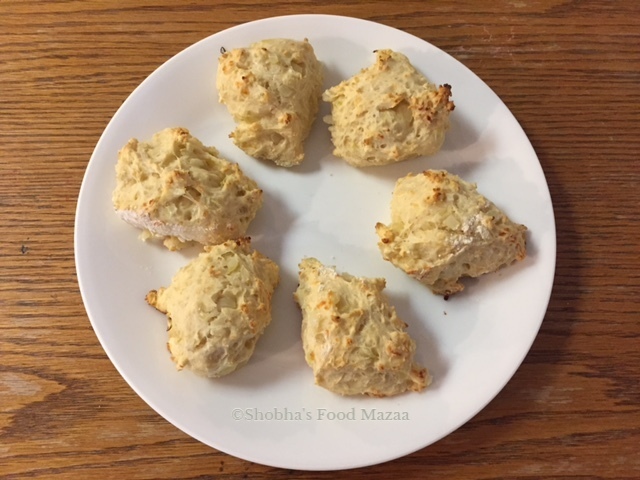 I don't make savoury scones very often , these look like a perfect tea time treat. Yes Nayna.. do try them.